Thermal labels compatible with the Intermec EasyCoder PD41. 3" x 1" Direct thermal paper label. 5333 labels/roll, 4 roll case. 4" x 6" Thermal transfer paper label. 895 lables/roll, 8 roll case. 4" x 2" Thermal transfer synthetic label. 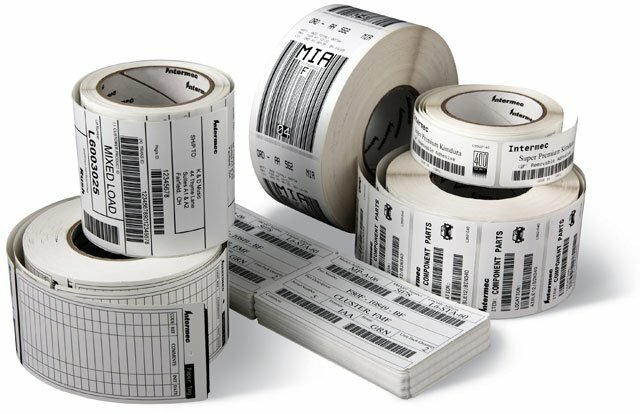 2823 labels/roll, 4 roll case. Also available as a roll (Part# E23222-R). 3" x 1" Thermal transfer paper label. 2,666 labels/roll, 4 roll case. 3" x 2"Thermal transfer polyester label. 2820 labels/roll, 4 roll case. Also available as a roll (Part# E23069-R). 3" x 1" Direct thermal paper label. 5333 labels/roll, 8 roll case. 3.25" x 2" Thermal transfer paper label. 2,280 labels/roll, 4 roll case.